By all reasonable calculations, a black child who started life with as many formidable challenges as author Cyril H. Price shouldn’t have prospered to the point of happiness he currently enjoys. In fact, at eight years of age, Price’s policy was to stay out of trouble, eat, and just survive. Growing up in the heart of Harlem during the Great Depression, Price and his family did what they could to survive. 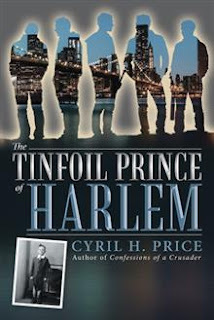 In The Tinfoil Prince of Harlem, he shares the details of his life living in the midst of poverty, hunger, racism, family upheavals, and gangs. From his birth in New York City, to Ethiopia, to Trinidad, and back to New York City, Price tells about the death of his father at the age of forty-three and how his mother barely made ends meet to feed Price and his older sister. Including details about his schooling, living conditions, and scrounging for bottles to earn money, The Tinfoil Prince of Harlem shares how one African-American boy rose to the challenge. He eventually became a dentist, an author, and a professor and raised a family of his own.